Since the tomato entered our diets, it has been bred into many, varied cultivars. 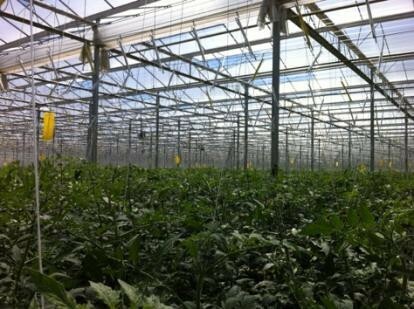 Greenhouse production has its own unique tomato varieties. 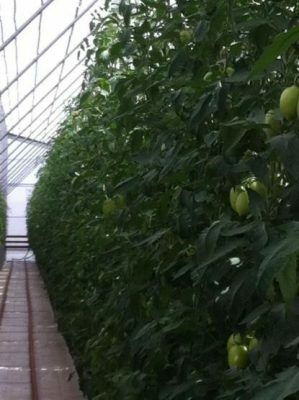 Whether organic or conventional, the strategy is to keep the fruit clean of pests and pest residue. Fungus gnat: the larvae of fungus gnats can damage the roots of young plants. Fungus gnat also spreads the disease Pythium. To control, release Stratiolaelaps scimitus preventively onto all seedlings. Stratiolaelaps works well in many types of substrates, including rockwool, coconut fibre and soilless mix. 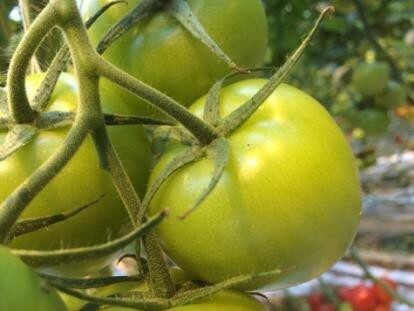 Whitefly: worldwide, there are two common species of whitefly which infest tomato: Greenhouse whitefly ( Trialeuroides vapororium ) and Bemisia whitefly ( Bemisia tabaci =silverleaf, sweet potato ). Larvae cause direct damage and the adults can vector many different viruses. Choose the beneficial parasite which works best against your species of whitefly. The parasite Encarsia formosa attacks (parasitizes) the young stages of whitefly and not adults. Also, it kills young whitefly by host-feeding (stinging). Use Encarsia against greenhouse whitefly. The parasite Eretmocerus eremicus functions similarly to Encarsia. However, both greenhouse and Bemisia whitefly are attacked byE. eremicus. Aphid: most infestations are the green peach aphid or potato aphid. There are two species of Aphidius parasites which are quite effective against many species of aphid. Choose the beneficial parasite which works best against your species of aphid. Aphidius colemani attacks green peach and Aphidius ervi attacks potato aphid. Leafminer: the larvae of these dipterans ( =fly ) “tunnel” through leaves. The damage of some lepidoptera can appear to be similar. A parasite called Diglyphus isaea will control dipteran lefminers. Lepidoptera: the larvae of many species feed on or in tomato plants. Control is achieved through a combination of egg parasites ( Trichogramma spp. ) , Bacillus treatments for larvae and light traps for adults. Choose the beneficial parasite which works best against your species of lepidoptera. Thrips: while feeding damage on fruit can cause some economic loss, the biggest losses can be attributed to this pest’s ability to vector viruses. 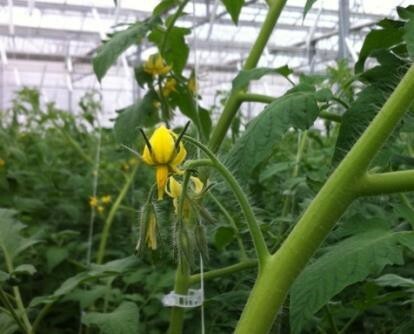 Contact your advisor about thrips biocontrol on tomato. Spider Mite: treat hot-spots with focused introductions of the predator mite Phytoseiulus persimilis.